Aged just eighteen years-of-age, Mairi Chisholm was one half of the two most photographed women of World War One. Mad keen on motor-cycling, she met Elsie Knocker (30) at various motorbike competitions around the country. 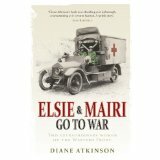 Following the declaration of war on August 4th, 1914, Elsie suggested to Mairi that they join the Women’s Emergency Corps. After spending the first month of the war as dispatch riders in London, they were asked to join the newly formed Flying Ambulance Corps assisting wounded Belgian soldiers. Mairi and Elsie landed in Belgium on September 25th, 1914 where their first job was ferrying casualties to a military hospital in Ghent. In November, they moved to Pervyse and spent the next three and a half years only 100 yards from the front line, performing first aid, transferring the wounded to hospital and retrieving bodies from No Man’s Land, from a cellar only six feet high. They funded this work themselves and often had to return to the UK to raise money. Their work only ended on 17th March, 1918 when they were both almost killed in a gas attack. Mairi Chisholm died in Scotland in 1981 aged 85. Their full story has been told in the books Elsie and Mairi Go To War and, The Cellar House of Pervyse. I’m still on the search for the Canadian Native soldier who supposedly died in Glasgow, Scotland in 1916. His name – Gay Flier – appears to be wrong, so it’s going to be a challenge. However, The Commonwealth War Graves Commission responded with a very informative e-mail giving me the names of 42 Canadian soldiers who died and were buried in 7 different cemeteries in the Glasgow vicinity from 1915-1919. Unfortunately for my particular search, there is no native sounding name among them. The list makes for sober reading. The youngest victim was 17, a seaman from Newfoundland, the oldest a 45 year-old American from Florida who joined the Canadian military. Most died of ‘wounds’ or pneumonia – one was ‘accidentally killed’ – and you can’t help but wonder about the stories behind these men. One, a member of the Canadian Forestry Corps, had a Glaswegian wife. Was theirs a wartime romance that ended in tragedy? But the name that really caught my attention was that of Private James Crawford Begg, 31st Brigade, Canadian Infantry. Died of pneumonia following wounds (gas) 5th of February 1919. Age 22. Son of William and Janet Napier Crawford Begg of 219-14th Ave West, Calgary, Alberta. Born at Govan, Glasgow. A young man who emigrated to Canada for a better life and then died in the city of his birth. And the fact that he died more than three months after the war ended… So sad.